I've decided to stick to my noise/drone/lo-fi genre in the future. While Radio23 is still in Beta, I'll possibly do another couple of shows of indie/pop/folkish tunes, but it suits to keep to relative genres since the station will be splitting into various genre-based channels. I've been addressing copyright issues and contacting artists where I can. If you are on my playlist and I haven't yet contacted you - I'm sorry. I do intend to make sure I receive permission from all artists. Gotta do the right thing! Thanks to Andy McLeod for sending through a track at the last minute. 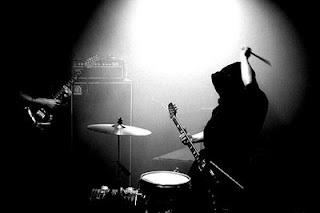 Very very pleased to include new track from new Auckland sludgy metal fiends, Evil Ocean. Finish with two tracks from one of my all-time favourite bands, The Skeptics. I saw them play in Timaru so many years ago. They opened my ears and my eyes. Waaaaaaaaaaaaaaa what's with the weird characters interlaced in the text?? Frick! Wasn't bloody like that this morning when I looked at it! All fixed. Aha. So that's what happens when I use a stupid applescript to extract my playlist from itunes. I won't be doing that again.